You are here: Home / Dogs / Please Welcome … Wally! 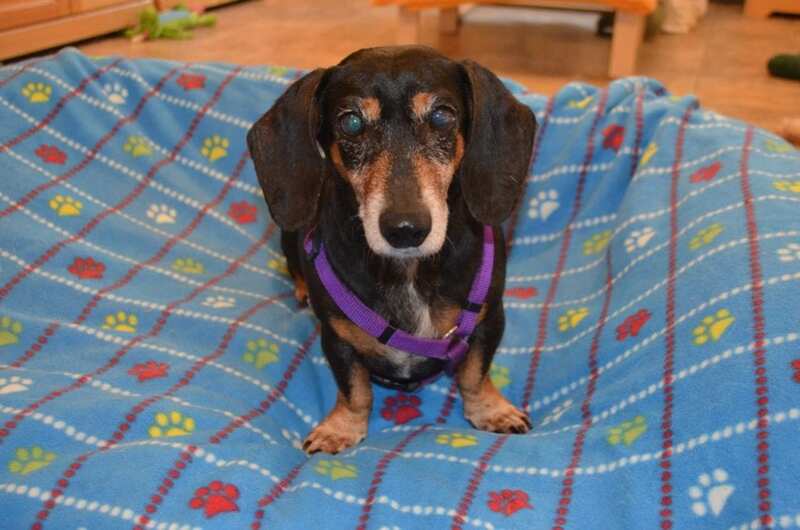 Here’s our newest arrival, a nine-year old blind Dachshund named Wally. He came last month from a shelter in Houston that had been trying to adopt him out since May, but without much luck. Wally had his own family in Texas and was doing great … until the new baby arrived. It wasn’t long before his owners took him to a vet clinic for euthanasia, claiming he had bitten the baby (though they acknowledged the skin wasn’t broken and no blood was drawn) and also — we are not making this up — that Wally was having a hard time getting around the house now because of all the baby toys on the floor. The veterinarian persuaded the owners to surrender Wally to the clinic, rather than euthanize him. Wally eventually made his way to a no-kill shelter in Houston, where he was a staff favorite. Sadly, though, no potential adopters stepped forward. We offered to give Wally a home with us, and the shelter happily agreed. He is a very sweet boy, loves to be held and cuddled, and gets along wonderfully with everyone. I will often be working at my desk when I feel a pair of Dachshund paws on my chair — it’s Wally, standing up on his hind legs, trying to get into my lap. I will pick him up, let all of his 24 pounds sit on my lap for a while, then put him in his oval bed that’s next to my desk. We took him to our veterinary ophthalmologist in Burlington, Dr. Sarah Hoy at Peak Veterinary Referral Center, a couple of weeks ago for a complete eye exam. Unfortunately, she found Wally is blind most likely from SARDS, or Sudden Acquired Retinal Degeneration Syndrome — the “syndrome” meaning they still don’t know what causes it. Thus there isn’t anything we can do to restore his vision. But Wally is a smart boy, and within 24 hours of arriving here, he was already finding his way from the dog yard, across the deck, and up the ramp to the back door. His first night was a version of “bumper cars,” but by the next day, he had mapped the house and knew his way around. This week I’m taking him back to Peak for a full “senior screen” — blood panels, abdominal ultrasound, X-rays, and examination by our internal medicine specialist, Dr. Marielle Goossens. 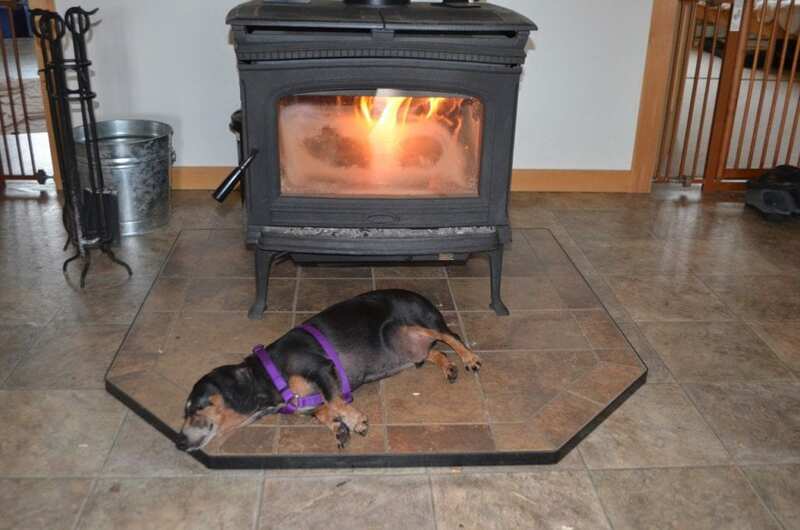 We’ve never known a Dachshund who didn’t love to be near the wood stove in winter! So with that, please welcome Wally! So sorry to hear about Sophie. 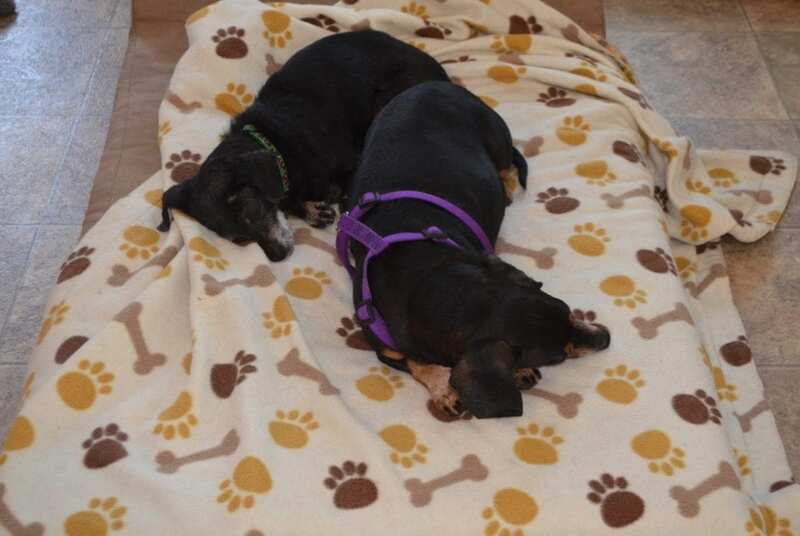 I was hoping she was still doing OK. It’s fitting that Wally appeared to fill the dachshund gap. Obviously you needed someone to take charge of the household! He is such a handsome boy, too. 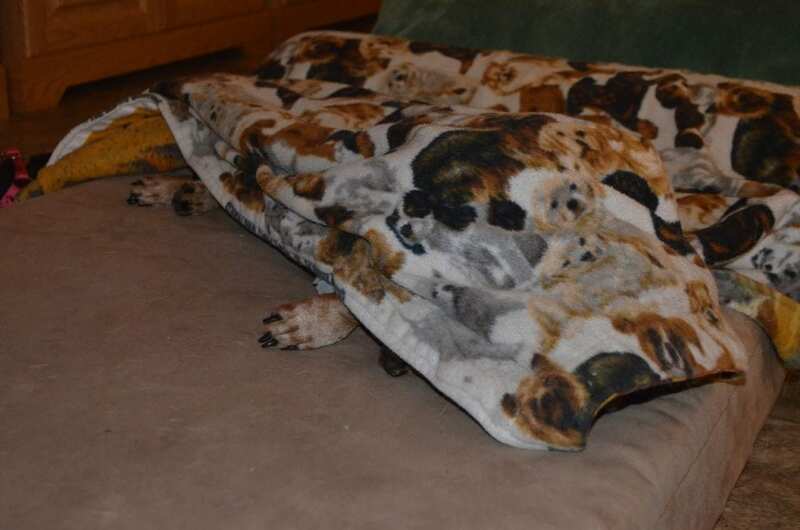 I love the dachshund burrowing trait, it’s so cute. It’s unbelievable that someone intended to euthanize that sweet dog. You are so much better off now, Wally! Welcome Wally!! You have hit the jackpot! Hugs and kisses to Wally. He’s adorable. Welcome Wally. What a very lucky dog you are to be at Rolling farm with wonderful caring people, good doctors and lots of friends to play with. 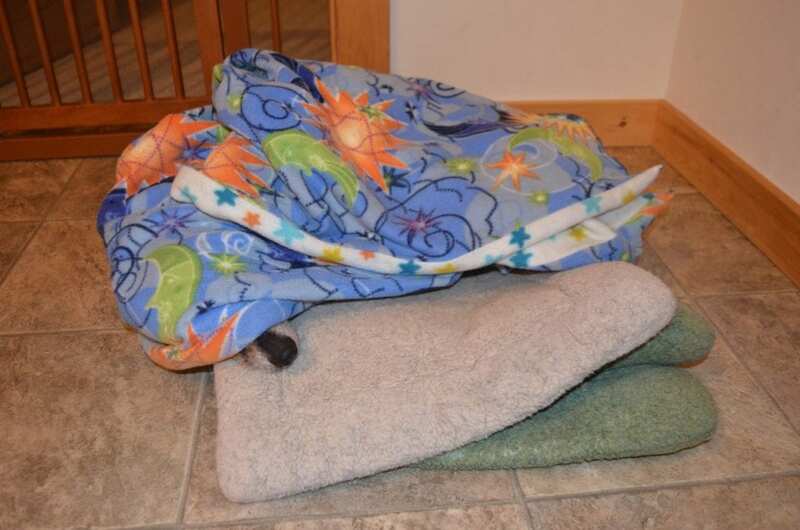 Enjoy your burrowing. Welcome Wally. You are one lucky boy. I’m so very sorry to hear about Sophie. She was sweet. You have to wonder about people when they think animals are disposable. It’s hard to comprehend. But it looks like Wally is already one happy guy and that name seems to fit him. Love those photos of him under the covers. He will have one wonderful life with his new friends. I’m glad he has a new home with you. This is one lucky dog, to have found his way to you. Merry Christmas, Wally! Alex, thank you for giving him that sleepover weekend! Hello! I?m the vet tech that took him in to my home even though it wasn’t allowed? and I reached out to special pals to help me. He’s such a sweet baby and he deserves to have a happy ending. Thank you for providing that. My heart is full. Brittney, thank you for taking him in and for getting him to Special Pals for that second chance … and thanks to Special Pals for providing such wonderful care until he came to us. Thank you for rescuing Wally and giving him the best forever home he could have!